If memory serves, it was twenty or so years back at the world’ largest aquarium (and general pet) show, the Interzoo, that I first experienced really small (a few gallon) reef systems. These pico reefs were successful miniature marine worlds, but I feared for the hobby’s trend here for ever-smaller systems. My concern exists to this day, “What will happen if aquarists fail too easily with such small volumes?” It’s so that the bigger the tank, the more stable chemically, physically and biologically it is; the more forgiving for power outages, overfeeding mistakes, livestock deaths. Be this as it is, pico systems have persisted, indeed continue to increase in popularity; not only due to better gear, more knowledge on their owners part, but the increased availability of very small livestock. Happily, this last includes the captive production of several small fish species. 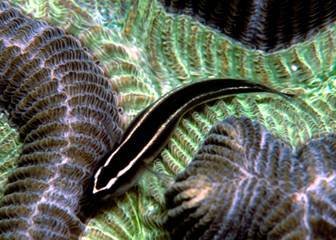 Let’s hit the highlights of what’s currently around small goby wise and their application to little reef systems. 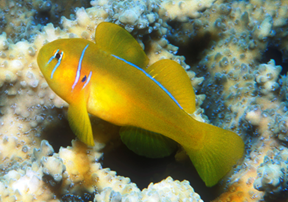 Other than the usual being aquarium hardy, good-looking and interesting behaviorally; fishes for very small reefs have to stay small, get along with other chosen livestock, and adapt well to small confines. 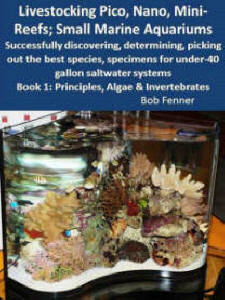 It is fortunate that there are several species that fit these criteria; and that of these, more and more are being captive bred and reared for the aquarium hobby. 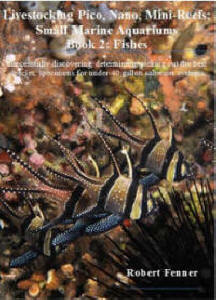 According to Fishbase.org (from Eschmeyer’s Catalog of Fishes), there are presently 258 genera and 1,767 species comprising the family Gobiidae. 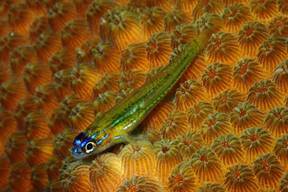 As such, Gobies are the second largest family of fishes, after the minnows, Cyprinidae, with some 3,072 species. 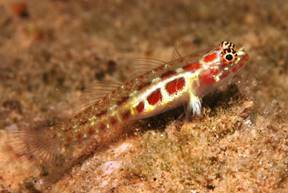 Gobies are mainly saltwater though some are brackish and freshwater. Though they look superficially like blennies, Gobiids can be told apart by their fused pelvic fins. 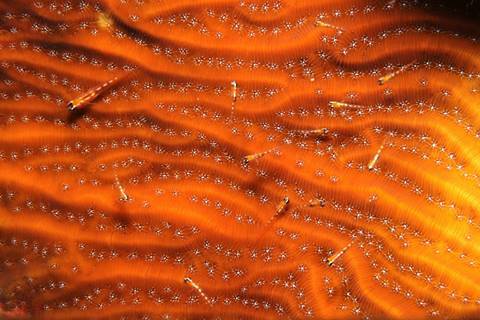 Most are cryptic, living on the bottom, eating small invertebrates, though a few are planktivorous. It’s their small size and bottom, hidden living habits that make so many of the very small Gobiids ideal for use in small marine systems. Though some, mainly larger species are territorial to the point of having to be individually stocked in little tanks, the species we’ll cover here are more social; often encountered in the wild in loose associations of several specimens. Lest this appear to be an enlarged advertisement for ORA (.com); they DO produce many of these fishes for the ornamental trade. 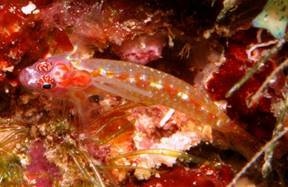 Proaquatix too is producing commercial numbers of small gobies: http://www.proaquatix.com/gobies/. Otherwise, the species listed here are available wild-collected on a punctuated basis. If you don’t see them at your dealer/stockist, DO ask for them to inquire in turn of their suppliers. 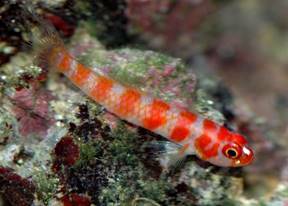 Good small gobies are easy to find; they almost always are of either end of the spectrum: healthy and ready to go, or rarely, on the verge of death. 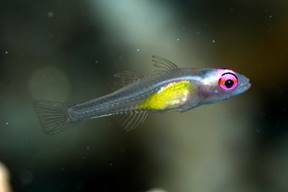 Look for the behavioral descriptor of "brightness" with these small fishes… that they're out and about, looking at you, the other life in their system, alert to danger and the possibility of food. What to look out for? Avoid tanks that have any Gobies with apparent spots or breaks in their skin… this batch may be in the process of "breaking down"… not a specific ailment per se, but a "handling syndrome" where aquatic life is failing in response to poor environment and microbial involvement. And don’t buy newly arrived specimens. Most incidental losses of livestock occur within the first day or two of being new. Better to let all rest up a few days to a couple weeks. Often dealers will hold sales with a deposit if you’re concerned the livestock will sell. These times are tough. With the rising cost of everything; systems, energy, water… there are good reasons to go small. Pico systems can be made to work, given study, careful set up and maintenance. Investigate your options carefully; there is much range in quality and functionality in small tanks, lighting, filtration, circulation… Take the time to read leisurely of the hobbyist sites that proffer first hand reviews what is currently on the market and of use. It is extremely easy to have small volumes drift to dangerous water quality parameters in a matter of days. Trying to adjust water quality in the system itself is fraught with danger from potential overdosing. What really works re regular upkeep of small systems is sticking to an established routine. Water testing may reveal problems, but often they are too late with warning of eroding water quality. It is much better for you to develop the practice of pre-mixing and storing change out water, and switching a good 25% out every week. Any adjustments for alkaline earths, pH, buffering capacity to be made in the new water, not attempted in the few gallons of extant system water. The genus Gobiosoma has been largely moved to Elacatinus. These little cleaners were some of the earliest scientifically and commercially captive produced fishes. Oh, and they still are, and for good reasons. 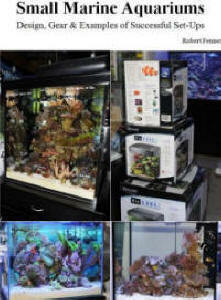 They’re beautiful and functional, not only getting along with all other fishes, but providing valuable cleaning services. Here’s an E. evelynae cleaning up a Cephalopholis cruentata down in Turks and Caicos. 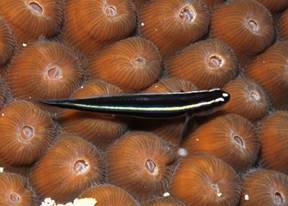 The Sharknose Goby, Elacatinus evelynae Bohlke & Robins 1968. Tropical West Atlantic; Bahamas to Venezuela. To about two inches in length. Variable in color, but yellow-V-shaped mark on nose and bluish stripe sandwiched between black. Available captive-produced from ORA. 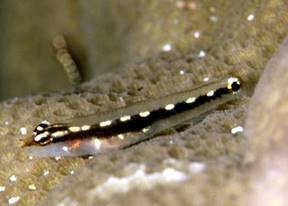 Elacatinus illecebrosum Bohlke & Robins 1968, the Barsnout Goby. Central Western Atlantic; Yucatan of Mexico to Panama. Identified in the field by a white bar that runs midline between the eyes, blue line on either side of the body that extends to the tail. Cozumel image. 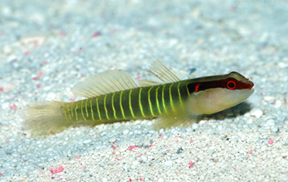 Elacatinus (formerly Gobiosoma) oceanops Jordan 1904, THE original Neon Goby. Tropical West Atlantic; southern Florida to Belize. To two inches in length. At right, a pair down in Key Largo, Florida. 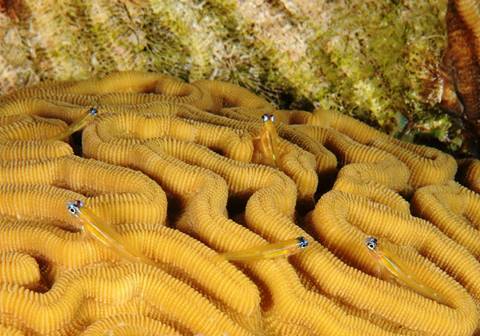 Below; a grouping on a Montastrea cavernosa coral in Roatan. Available captive-produced from ORA. 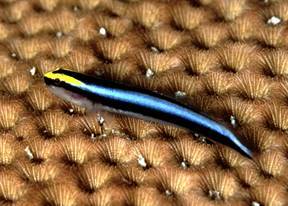 Elacatinus prochilos Bohlke & Robyns 1968, the Broadstripe Goby. Tropical central West Atlantic. To four cm. Bred in captivity. Here off of Cancun, Mexico. 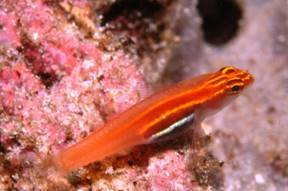 Elacatinus puncticulatus (Ginsburg 1938), the Red Headed Neon Goby. Eastern Central Pacific; Sea of Cortez to Ecuador. To under two inches in length. A real beauty and tough, though small addition to reef tanks. One in Puerto Vallarta, Mexico. Available captive-produced from ORA. 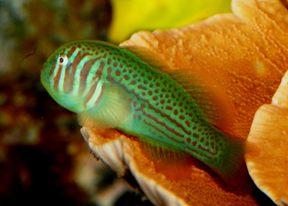 Tigrigobius (formerly Elacatinus) multifasciatum (Steindachner 1876), the Greenbanded Goby. To two inches maximum length. Western Atlantic: Bahamas and Central America to northern South America. Aq. Pic. Available captive-produced from ORA. Though only attaining a maximum of 2 1/2 inches, Gobiodon are huge on color and spunky personality. 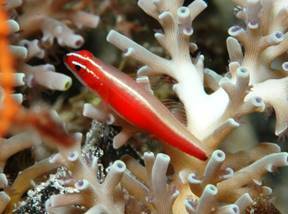 Due to their noxious body slime no other fish bothers them, and they're happy as proverbial clams with some live or skeletal Acropora coral to perch on and a little live meaty food. There are 27 described species in the genus; the hobby sees a handful on a sporadic basis. 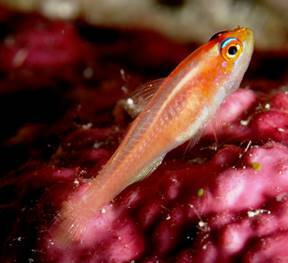 Gobiodon citrinus (Ruppell 1838), the Citron or Poison Goby. Indo-Pacific; Red Sea, African coast to Samoa. Found in close association with table top Acropora species. To two and a half inches in maximum length. Below: "Normal" and dark ones in captivity, and one in the Red Sea in a typical setting, on top of its table coral domain. 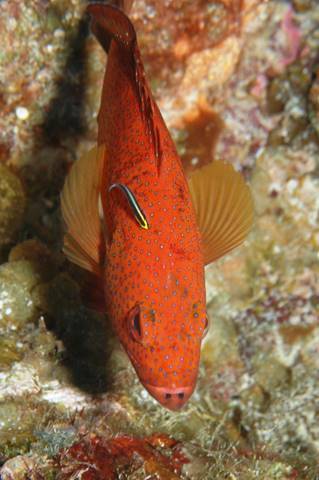 A Red Sea specimen here. Gobiodon rivulatus (Ruppell 1830), the Rippled Coral Goby. Indo-West Pacific; Red Sea, eastern Africa to the Tuamotus. To two inches in length. Aquarium image. Most members of this genus live on living sea whips, which are hard to keep in captivity; though one is a schooler, just hanging above the substrate in almost undetectable groups. Coryphopterus lipernes Bohlke & Robins 1962, the Peppermint Goby. Western Atlantic; Bahamas to the Lower Antilles, Caribbean coast. To one and a quarter inch in length. One in Curacao at right, and a grouping below in Bonaire. Coryphopterus personatus, (Jordan & Thompson 1905), the Masked Goby. To 4 cm. Western Atlantic; Florida to Lower Antilles. 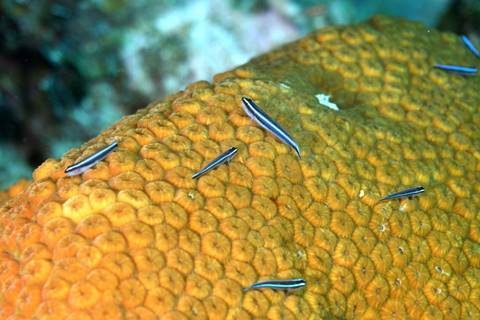 Bonaire and Jamaica pix, where this species is ubiquitous on the coral reefs. In Roatan at right, and a group on an Agariciid below in Bonaire. Available captive-produced from ORA. 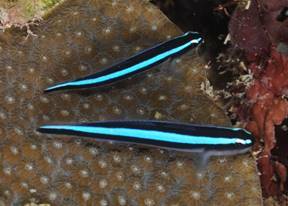 This genus and the next (Trimma) were some of the most beautiful and first used tiny gobies for pico systems. Indeed, these were the fishes I espied two decades back at Interzoo that really caught my eye. Thirty five described species, with many more to go. Eviota guttata Lachner & Katella 1978. 2.5 cm. Western Pacific and Indian Ocean, including the Red Sea. This one with a copepod parasite in Raja Ampat. Eviota nigriventris. Wakatobi, S. Sulawesi pic. Eviota prasites Jordan & Seale 1906, the Prasites Goby. West Pacific; Moluccas to Samoa. To less than an inch in length. This one photographed off of Queensland, Australia. Eviota sebreei Jordan & Seale 1906, Sebree's Pygmy Goby. Indo-Pacific; Red Sea to Samoa, to the northern GBR, Micronesians. To less than an inch in total length. This one perched on a Porites coral in Pulau Redang, Malaysia. Trimma canna Winterbottom 2004. 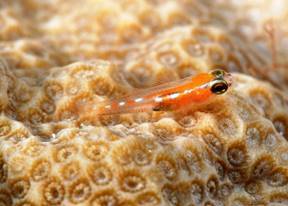 Candycane Pygmy Goby. To one inch in length. Western Pacific: Philippines, Caroline Is., Fiji, Marshall Is., and Palau. Here in an aquarium. Trimma taylori Lobel 1979, Yellow Cave Goby. Indo-Pacific; Chagos, Hawaii, Guam, Indonesia, Red Sea. Found in caves, often upside down. Feed on harpacticoid copepods principally. To 3.5 cm. Males with longer first dorsal finnage, and yellow spotting on fins. S. Sulawesi pic of a female. Yes; there are more to choose from, but for you here I’ve selected genera/species that are most available, captive-bred and likely to be so in the near future, AND ones that can be more readily mixed as single or multiple species assemblages in small volumes. 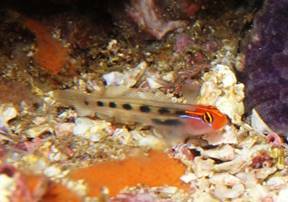 Many other small goby species need more than a square foot of bottom space per individual and/or can become overly territorial in time. Systems under five gallons (picos by definition) aren’t easily kept. Small changes in outside temperature, an over-feeding, a missed death in the tank can quickly lead to catastrophic cascade effects and loss of livestock. Fortunately there are several small fishes, particularly Gobies that are well-suited for such small volumes. Even more fortunate is the availability of a growing number of these fishes as captive bred and reared specimens. These have proved much more aquarium hardy and adaptable to captive conditions.